Everything creamy and delicious you love about comforting broccoli soup without the dairy & packed with nourishing bone broth and veggies! It’s the first week of August and I’m already in back to school mode! Because in just a few short weeks, I’ll not only be packing up my husband’s meals for work every evening, I’ll have a new kindergartener that is super excited about getting to bring her own lunch to school everyday! I’m taking 1-2 of my soups every week to batch up for my freezer stash. That way I can pull them out easy for lunch additions. My family stays nourished with real food – and a load of sicky bug fighting chicken bone broth! Last week I tackled my creamy veggie soup and broccoli soup. Both are super kid friendly and always a hit at my table. The girls practically guzzle this one down – and the baby had her first taste of broccoli soup and just loved every bite. 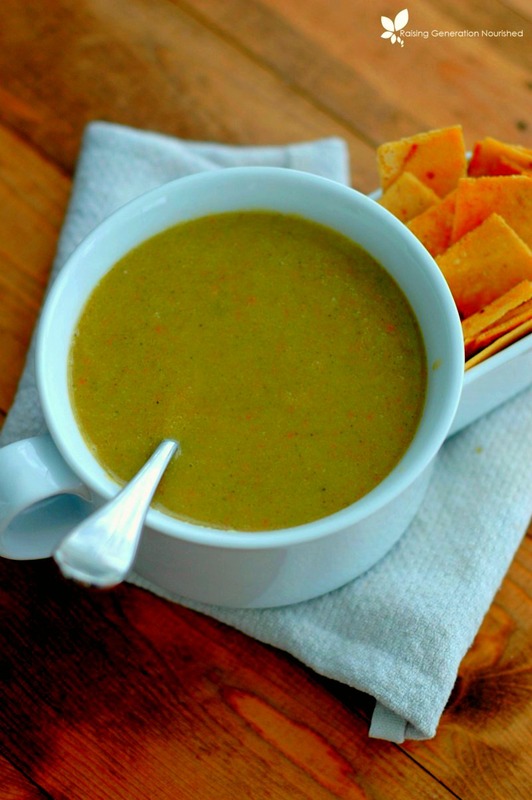 You can use fresh or frozen broccoli for this soup. 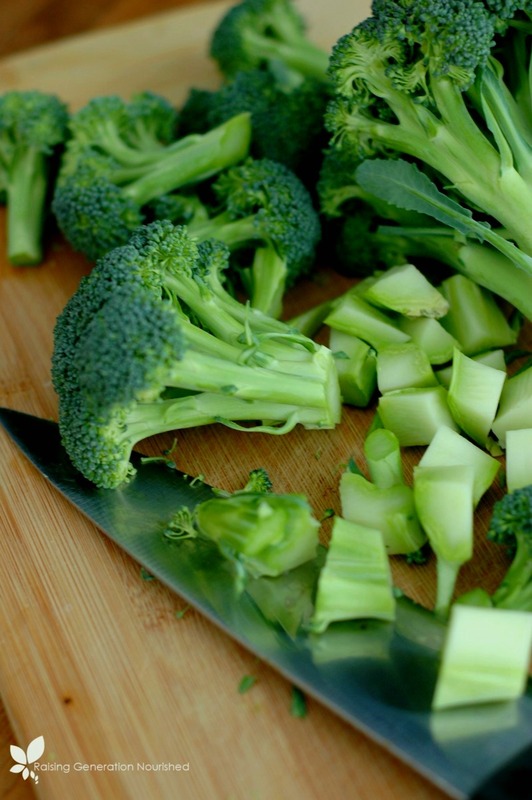 What I love about using fresh broccoli is that you can use the stalks and all! It all gets pureed in the end so you really can use the whole veg! When I am short on time, I like to use the big bags of organic frozen broccoli that Costco carries – it’s a great deal! For $7 I can make 7-8 quarts of soup – you won’t find that at any store – especially organic! I love using soup as a way to get vegetables and bone broth into my kids. 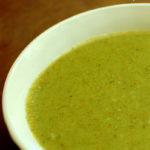 This broccoli soup freezes beautifully. ½ cup brown rice flour If you are grain free you may omit – it still tastes great it just won’t be quite as thick. You could leave out a cup of liquid if you wish for a thicker soup. OR you could add a few potatoes to the veggies as they cook to help with thickening it up. Don’t try coconut or almond flours – it just doesn’t work! 4 quarts chicken stock preferably homemade for more nourishment – see Tips section for how to make your own bone broth in the slow cooker! In a large stockpot, sauté the onion, carrots, and broccoli in the friendly fat with a few pinches of salt for about 10-15 minutes, until the onions are clear and the broccoli is bright green. Add the garlic and brown rice flour and cook a minute or 2. Reduce to a simmer until the broccoli and carrots are soft and cooked through, about 15ish minutes. Turn the heat off, and puree the soup completely with an immersion blender. Could blend in a regular blender if you wish. Add sea salt/pepper to taste. Add a few splashes of cream or coconut milk if you want, or top with sour cream or raw cheese! This freezes up great! Freeze in BPA free single serving freezer containers for easy transport to work or school. Right now I freeze in quart jars or half gallon containers . I actually have my eye on THIS freezer container set – I really one this one! I am still planning on freezing in larger containers as I pack my husband’s soup in his travel CrockPot to warm up himself at work, and I will be using this stainless soup thermos for my daughter’s lunchbox. I will keep the rest of the thawed out soup for the other littles and myself at home to have for lunch! This batch makes enough for the girls and I to have lunch, and then about 5-6 quarts leftover for the freezer. You can thin out the soup to stretch it if you want – it isn’t super thick but it certainly can be thinned out with more bone broth, and still taste yummy. TO FREEZE, leave the tops off the jars and let them come to room temp or sit in the fridge to cool off. Then transfer to the freezer with the lids off for 24 HOURS so they will expand to freeze without breaking your jars! You can put the lids on after a day of freezing. HERE is how to make your own bone broth for your soup! Slow cooker style so it is super easy! If you don’t have an immersion blender for your kitchen…oh! You must please treat yourself to one! I use mine almost everyday! Don’t forget the babes! 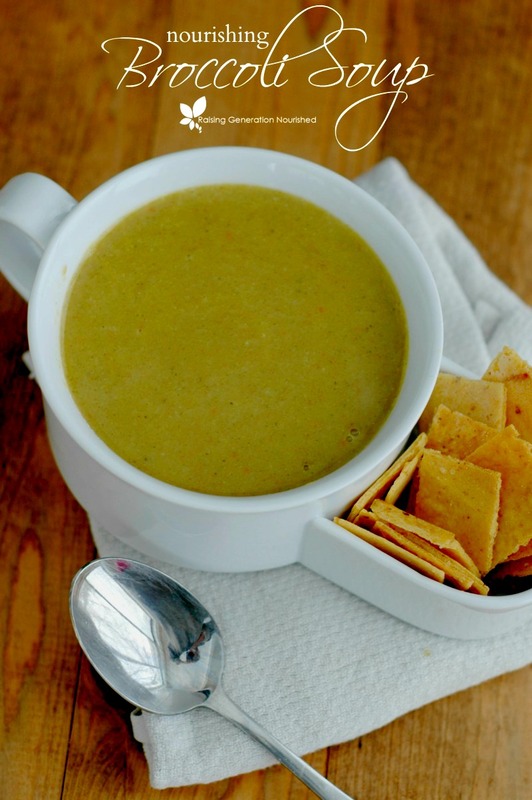 Once you are ready to start soup purees this is a fun one to try – all of my babies loved this one from about 9 months on! Looking for more great lunch soup ideas? 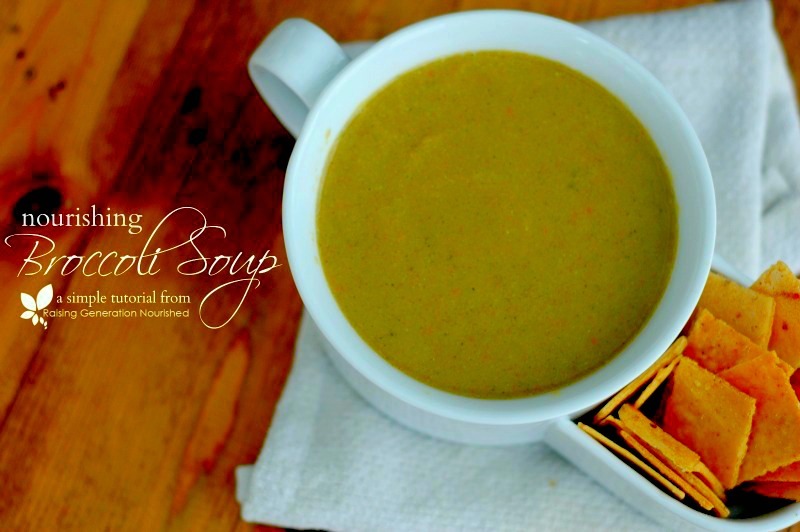 Try creamy veggie soup, fresh tomato soup, veggie beef soup, or roasted garlic soup! 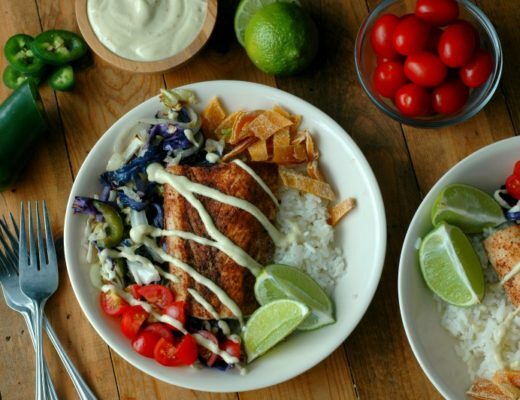 Mahi Mahi Fish Taco Buddha Bowls With Dairy Free Chipotle Garlic Lime Aioli :: Paleo Friendly Real Food! 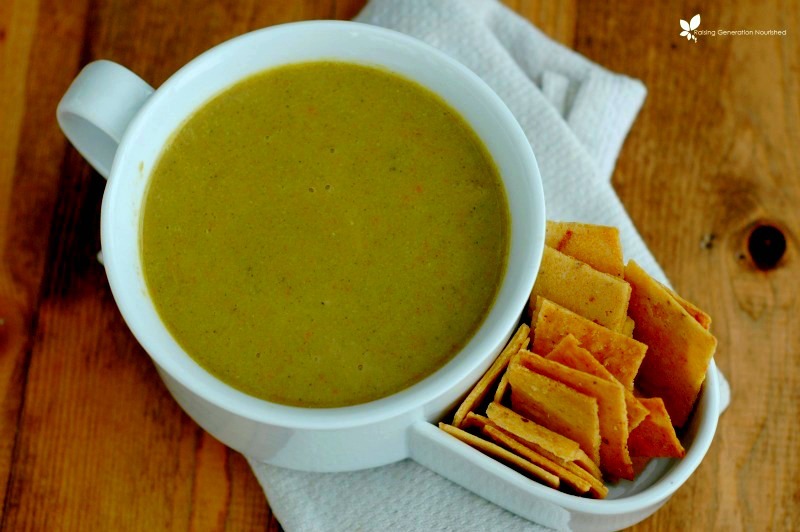 I’ll have to try this one…my kids love cream of broccoli soup, I’m sure they’ll like this one. Awesome – let me know how they like it! Also, one other question. Do you think this would thicken well w/ some grass-fed gelatin or arrowroot powder? I myself would use sweet potatoes also. Hi Nicolette! Oh goodness that is a post in itself probably 🙂 I use Costco for just about everything frozen organic veggie and some fresh produce like their big bag of organic carrots. I also get my coconut oil there – very good price. Organic peanut butter, organic quinoa, and some other pantry staples. And then toiletries etc too 🙂 I would not do the gelatin to thicken because it makes it a bit – well gelatinous LOL – like goopy slim. Arrowroot powder or tapioca flour would work. And potatoes definitely do the trick. Hope that helps! Yeah it is haha. My Heart Beets has a pretty good round-up on pantry items from Costco, but your recommendations mean a lot to me. Ewwwwww. Yeah… unless I had those flours on hand, I would go w/ sweet potatoes for a vitamin boost. Your entire comment was so helpful, thank you! I just have to ask, is that really how full you fill your quart jars to freeze? Just leaving the lid off the first 24 hours in the freezer will not break the jars when this full? That is great news! Thanks for this tip. Yum! I just love broccoli! This will be perfect as Fall approaches! This looks amazing, nourishing and so easy! Thanks for posting this. Hi Renee! I just want to say thank you for all your great advice and tips. I’ve been following your posts on Facebook for quite some time now. I’d like you to know that I use several of your recipes and tips in my kitchen for nourishing my own family, and it’s truly changed our lives. I’m studying to be a health coach, and I hope to one day have something similar to what you’re doing. I love how you give tips on how to stretch out meals and how to set ourselves up (stocking freezer and cooking bigger batches) for the week. One of my favorite recipes is for bone broth. It has so many health benefits, and I use it as a base for many dishes/soups- and that was bc of your post. So thank you for all that you share. You’re an inspiration! Can you please let me know what cheese/brand do you use when you refer to “raw cheese” in your posts? Also what kind of butter do you use? Also please let me know which brand coconut oil do you use from Costco. I get the Carrington Farms Extra-virgin coconut oil, but I’m noticed couple of health food websites refer to virgin coconut oil (instead of extra virgin) Please let me know if one variety is better than the other. Thanks in advance for your time! Hi Swarna! We get raw cheese and milk from our local farmer. We get butter from a local amish farmer that pastures his cows or we use Kerrygold. The Carrington Farms coconut oil is fine – there is no difference between those virgin and extra virgin labels actually from what I have read. Our Costco was carrying that brand and now has a Kirkland brand too sometimes they switch back and forth – I actually think they are probably the same thing. Thanks for the response! I love how you have access to farm fresh milk:) In which state do you live? I live in NJ, but very close to NYC. Everything in my town is insanely priced. Whole Foods & Trader Joes’ are my go to stores as they are only a block from where I live:) Any farm is atleast 50-60 miles from me:( So for now I can only dream of farm fresh milk! do you have to thaw the broccoli out before cooking it with the carrots and onions? Or can I throw it in frozen? Hi Kelly! It goes a little faster if the broccoli is thawed but you can get it in there frozen and it will work. Hi Renee, what’s the nutritional content for this? Or did I miss that? Hi Bethany! I’ve never calculated it before, but you could pull up a counter up on Google for nutrition content!